Although hypnosis as being a fairly controversial subject over the years. Scientific studies have shown that they can help with many problems. One such problem is pain and in particular the applications of it on the back. A variety of hypnotic techniques have been used to help pain in the back, the aim of this post is to explore some of those techniques. In 1981, a psychologist named Hilgard showed that there was two aspects the pain. First it was the sensory component the second and emotional component. He did this by hypnotizing a group of people and putting them through the called pressure test (which involves immersing arm in freezing water and reporting on pain over a 30 second time period). The people who were hypnotized reported no pain however, when pressured into a returned state of consciousness they almost immediately felt pain again. This lead Hilgard to propose his neo-disassociation which basically stated that hypnosis makes the brain disregard any feelings pain as opposed to drugs which simply log in information pain getting to the brain. The first self-hypnosis technique which can be used is called auto-genic training. This is perhaps most simple and effective form of hypnosis for back pain; it involves simply putting oneself into a hypnotic trance 2 to 3 times a day. This trance can be achieved using a variety of methods, the first of which is known auto-genic training. This involves an adopting a reclined position, then starting at the feet one needs to relax each body part. This is achieved by thinking thoughts which are relaxing, for example, if you wanted to relax your feet in could say something like “my feet are warm” or “my feet are heavy”. Once this has been done for everybody, you should be completely relaxed; in order to put yourself in a hypnotic trance you just need to count down from five. You should already feel that some pain has been relieved, however you can further reduces pain by thinking positive thoughts for example “my back doesn’t hurt”. The second technique is known as autosuggestion. There has been some controversy as to whether this technique is actually a form of hypnosis. 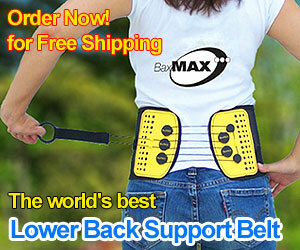 Regardless of whether it is or not it has been shown to help back pain. Like auto-genic training this method involves no equipment such as audio recordings. This is done by simply repeating a positive phrase after you wake up, and before you go to sleep. For example, in this case it would be “my back does not hurt”. Repeating this over and over for each day will help to reduce the emotional aspects of the pain experienced in your back. Finally, last hypnotic technique which can be used to help back pain is the use of audio recordings. These are specifically pre-recorded pieces of material which are tailored to the specific notice of the user, for example there are some which are specifically designed to help people quit smoking. Although they can be used any point in the day, they are most effective whilst the user is sleeping. This is because this is because the psychological walls between the conscious and subconscious are lower during sleep, hence, the recordings on able to better influence the subconscious. Although the user would have to and take in order to carry out this type of hypnosis, it requires no training to master so is a good choice for anybody who doesn’t have much free time. To conclude, while there are many hypnotic techniques which are able to help treat back pain, these are the main three. As they are the most effective and simple to understand. Try a sound machine to relax over at the BHI Store.